Most people in those situations would whip out their phone and just start recording, but what if you don't want anyone to know you're shooting video or taking pictures to truly capture the candidness of the moment? Developer Jimmy Halim has the perfect app for those scenarios. His creation, Spy Camera OS (SCOS), allows you to take discreet photos and videos by either shrinking down the viewfinder or hiding it altogether. On most modern smartphones, you'll have a screen size of around five inches or more. That pretty much means you have a gigantic five-inch viewfinder, revealing to everyone that you're playing paparazzi. But now, with Spy Camera OS, you can secretly play James Bond instead. 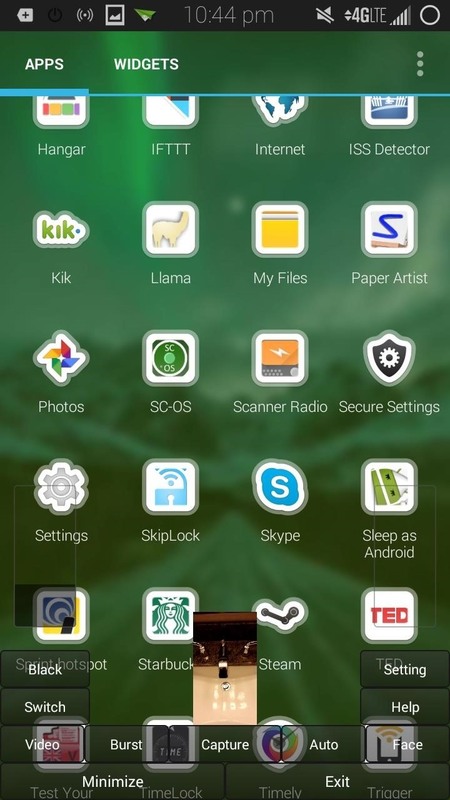 You can find Spy Camera OS for free on Google Play. The developer also has a thread on XDA where you might find upcoming beta versions with new features. 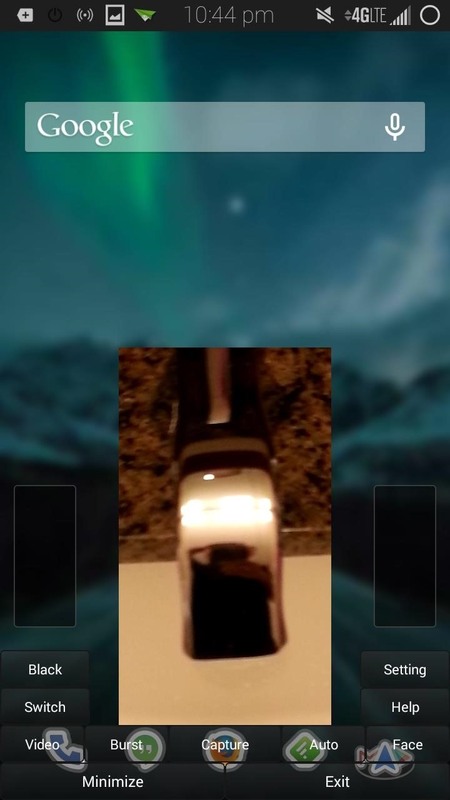 Once you open it up, you'll see the app's translucent overlay of camera controls, along with the shrunken viewfinder. 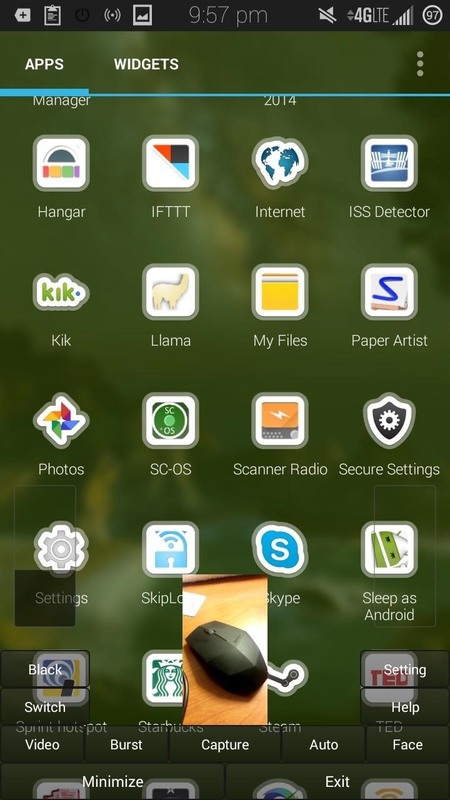 This set of controls will work anywhere on your phone—your home screen launcher, web browser, settings pages, games, you name it! By default, it's settled at the bottom of the screen, but you can tap and hold in any empty space and drag it up and down. I personally like leaving it at the bottom where it's a little more inconspicuous. It also works in landscape mode, so you can pretend to play games or watch Netflix while slyly taking photos or videos. "Just playing some Plague, not taking pictures or anything..."
There are quite a few buttons, so let's go over what each one does. 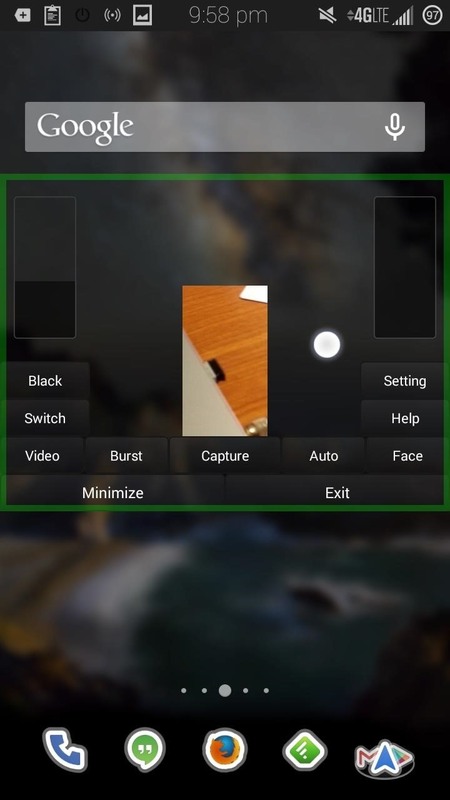 Black: Turns the screen completely black, but your camera will be active. 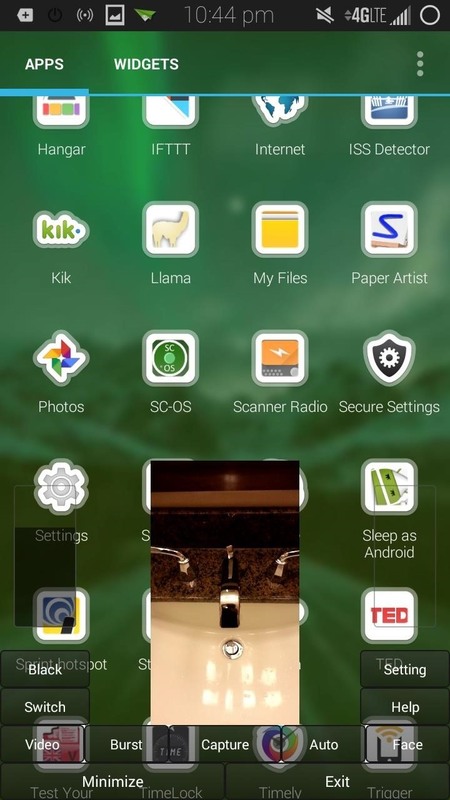 To take a photo, you can tap anywhere on the screen, or press either of your device's volume keys. It's the sneakiest way to take a photo, although it comes at the disadvantage of not being able to frame your shot with a viewfinder. You'll just have to point and pray you get a good shot. 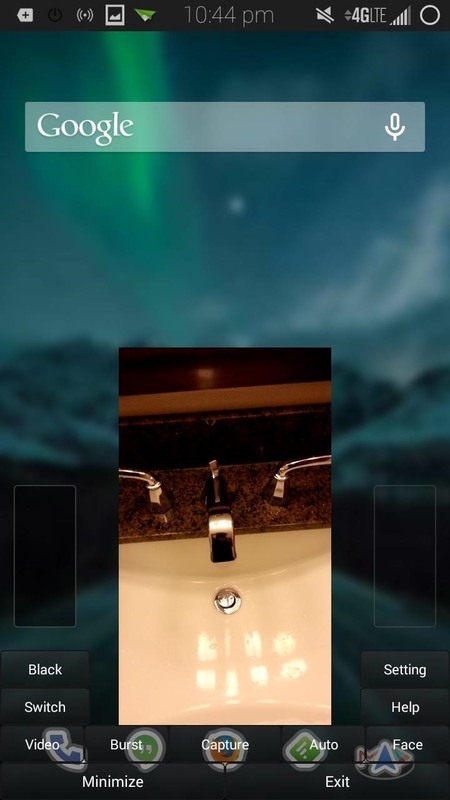 Switch: Toggle between front and rear camera. Video: Start a video recording. Minimize: Quickly hide the overlay just in case some nosy bystander gets close to discovering your secret camera. You can still take photos while it's minimized by pressing a volume key. If you want to bring back the interface, just tap on the discrete notification (you can also exit the app from here). Burst: Take a burst of shots (configurable between 4 and 10 in the settings). Capture: Takes a single photo. Auto: Takes one photo every few seconds (you can choose the increment in the settings). Face: An impressive feature that snaps a photo once the camera recognizes a face. Setting: Configure preferences like where photos are stored, picture and video quality, volume button controls, etc. You're probably wondering what the two vertical bars are for. The left one controls the size of the viewfinder. The higher you slide the bar up, the bigger the viewfinder will be, and vice versa. The slider bar on the right side controls the zoom. Easy enough, just swipe up to zoom in, and swipe down to zoom out. Note: Due to hardware limitations, zoom isn't supported on the Galaxy S3's front-facing camera. Your Spy Training Is Now Complete! Make sure you're aware of your state and local laws when it comes to filming other individuals. Don't get yourself into too much trouble! If you like the app, you can help out the developer by donating a few bucks or contributing feedback in his XDA thread. Did you capture the next viral video with the help of this app? Share with us in the comments!